State Class A Basketball Champions – 1977. NCAA National Champions – 1979. 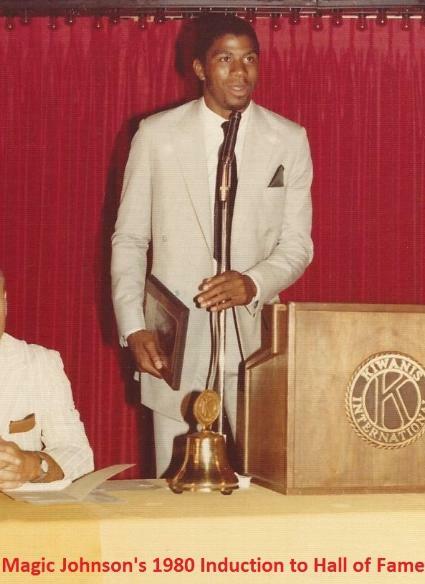 Big Ten Most Valuable Player – 1979. NCAA All-American – 1978, 1979. Selected first overall in the 1979 NBA Draft by the Los Angeles Lakers. NBA Los Angeles Lakers – 1979-1991, 1996. 5-time NBA Champion – 1980, 82, 85, 87, 88. 3-time NBA Finals MVP – 1980, 82, 87. 12-time NBA All-Star – 1980, 1982-1992. 2-time NBA All-Star Game MVP – 1990, 92. 9-time All-NBA First Team – 1983-1991. 4-time NBA Assists Leader – 1983, 84, 86, 87. 2-time NBA Steals Leader – 1982, 83. U.S. Olympic Gold Medal (Dream Team) – 1992.
in History in 1996, and enshrined in the Basketball Hall of Fame in 2002. Rated the greatest NBA point guard of all time by ESPN in 2007.